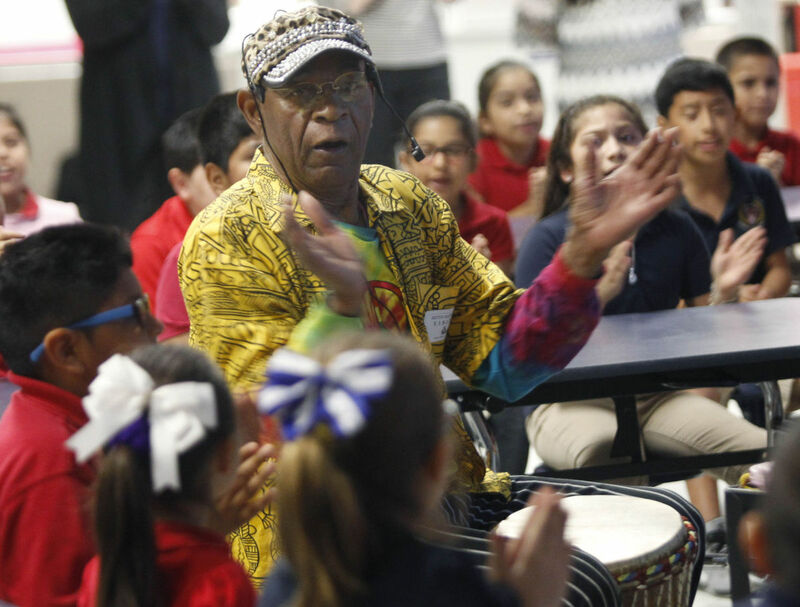 EDINBURG — Dancing, clapping and tapping their knees to the beat of the drums was part of how a group of third-graders at Betts Elementary School learned about slavery Monday afternoon during a book reading by author Lorenzo Pace. The reading of “Jalani and the Lock” served several purposes, from commemorating the Read Across America week to kicking off the University of Texas Rio Grande Valley’s Festival of International Books and Arts known as FESTIBA. Pace wears many hats, from being an author of four children’s books, to being a sculptor and painter whose art can be found around the world. And for the last eight years he has made the Rio Grande Valley his home working as an art professor at UTRGV. Unlike most book readings, Pace began his interaction with the children with music using flutes, drums and laughter, seamlessly engaging them to follow along clapping and tapping their knees to follow the rhythm. About 70 third-graders in the room had their complete focus and attention on Pace, who repeated every single word and sound amid giggles. But even thought the room was full of laughter, music and dance, “Jalani and the Lock” tells the painful story of a boy who was taken from his home in Africa and brought to the United States as a slave. A story based on the life of Pace’s great-grandfather. Locks and chains, the book says, not only enslaved Jalani but it stripped him of his liberty to be a child and change his language, his food and his clothes. “But they could not change his memories of home,” Pace’s story says. For Pace it was important to have the children follow along the reading, not only to keep their attention, but to have their young minds internalize what Jalani was going through. For librarian Ada Mendoza, who helped put the reading together at Betts Elementary, the idea of having fun while reading is key for having children get excited about reading. Mendoza said she had already read the book to most of the children and discussed the importance of the message with them, but seeing them engage in the Pace’s reading was impressive.